This variant is Sold Out but we can inform you when it is available. 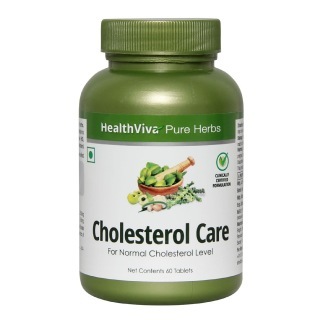 HealthViva Pure Herbs Cholesterol Care tablets is a clinically researched herbal formulation of natural herbs, like Arjuna bark extracts and Rason (Allium Sativum) bulb powder with proven effects and helps improve lipid profile without any side effect. The blend of traditional Indian herbs in Cholesterol care lowers LDL (bad cholesterol) and trigylcerides and increases HDL (good cholesterol) to promote and maintain a healthy heart. Arjuna (Terminalia Arjuna) extracts are used to treat cardiovascular diseases, in Ayurveda. The bark of the arjuna tree has potent antioxidants that are comparable to vitamin E with a significant cholesterol-lowering effect. Research studies go on to prove that arjuna bark extract when given to patients with stable angina, or chest pain led to improvement in clinical and treadmill exercise parameters. Get HealthViva Cholesterol Care today and keep your heart young, active and flexible. Take 1-2 tablets twice a day after meals for at least 30 days or use as directed.